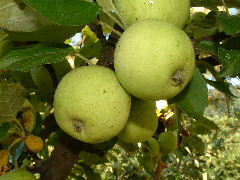 This is an old and long popular English cider apple which originated with M. Legrand of Yvetot, Normandy around 1872. It was named after M.. Michelin, a well-known aficionado of cider apples. The apple was introduced into England in 1884 by the Woolhope Naturalists’ Field Club. Fruit is small and pale green in color. It produces a sweet juice resulting in a clean, bittersweet cider ideal for blending with other ciders. Ripens late October to November.